This humble new establishment aims to prove that health food can be both delicious and convenient. 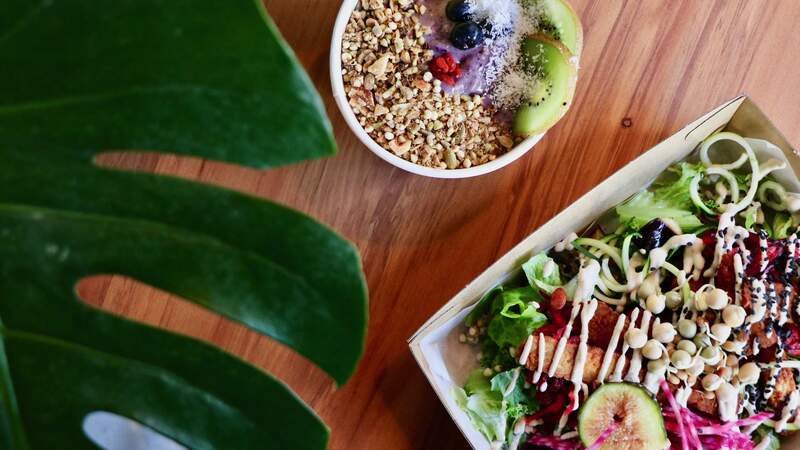 Whether it's a new cold-press juicery or a hot yoga studio, it's clear Auckland's health and wellbeing scene is taking off. Hidden between towering office buildings and small one-way streets is a wholesome eatery worthy of a nosey. Like something off the streets of California is Chancery Street's newest arrival: Health Nut Kitchen. This humble new establishment aims to re-work our preconceived ideas that health food can't be delicious and on the go. The interior of Health Nut is naturally lit and has been stripped right back to exposed walls creating a space that's light and inviting. Between leafy indoor foliage and magazine stacks are single coffee-bar stools and communal dining tables perfect to take five minutes out from city distractions. Proud owners Brogan and Luke have backgrounds in nutrition and personal training respectively, so we can sit back easy knowing our veggie bowl is in good hands. Centred around a concept of transparency, Health Nut Kitchen prepares everything right in front of you. Now we know precisely what's on our plate and more importantly, exactly what's going into our bodies. Luke's Breakfast Shake is something we'd definitely head back for. Packed with fresh blueberries, banana and peanut butter, it's high in protein and is the perfect example of a guilt-free breakfast. If you decide to pop-in around lunchtime try their appropriately named Plant Love lunch bowl. With smokey organic tempeh and a mind-blowing cashew cheese it will absolutely impress. It's most definitely apparent that Health Nut Kitchen is taking a holistic approach to wellbeing — a state of being comfortable, healthy and happy. There's no doubt that's something we ought to stop and consider a bit more often. With seasonal offerings and location to suit all city-goers, Health Nut Kitchen provides the ideal space to recover post gym, get on top of emails, or simply take some time out for yourself.